On March 15 a startling void was discovered in the basement hallway of Dorje Dzong in Boulder. 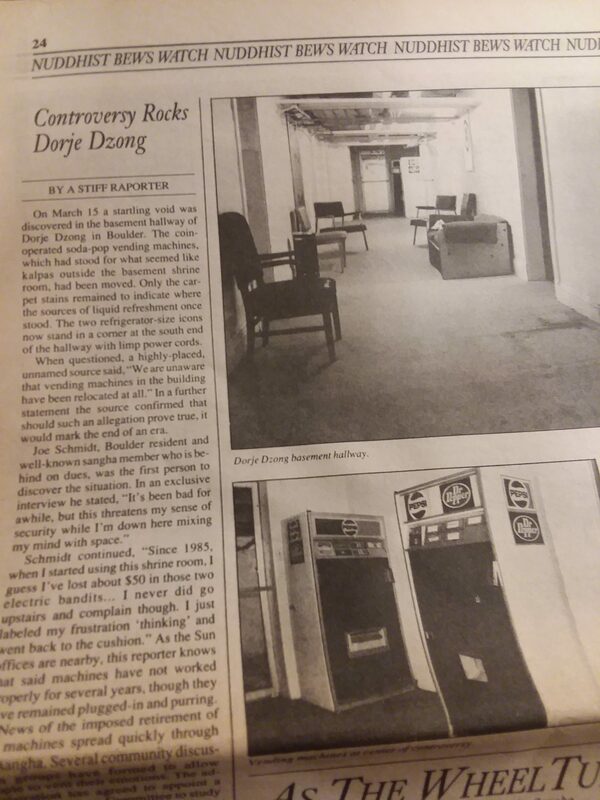 The coin-operated soda-pop vending machines, which had stood for what seemed like kalpas outside the basement shrine room, had been moved. Only the carpet stains remained to indicate where the sources of liquid refreshment once stood. The two refrigerator-size icons now stand in a corner at the south end of the hallway with limp power cords. When questioned, a highly-placed, unnamed source said, “We are unaware that the vending machines in the building have been relocated at all.” In a further statement the source confirmed that should such an allegation prove true, it would mark the end of an era. Schmidt continued, “Since 1985, when I started using this shrine room, I guess I’ve lost about $50 in those two electric bandits… I never did go upstairs and complain though. I just labeled my frustration “thinking” and went back to the cushion.” As the [Vajradhatu] Sun offices are nearby, this reporter knows that said machines have not worked properly for several years, though they have remained plugged-in and purring. News of the imposed retirement of the machines spread quickly through the sangha. Several community discussion groups have formed to allow people to vent their emotions. The administration has agreed to appoint a Vending Relations Committee to study the current situation. 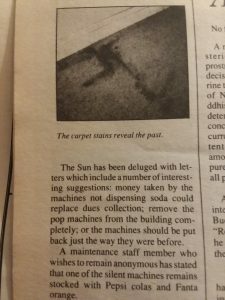 The Sun has been deluged with letters which include a number of interesting suggestions: money taken by the machines not dispensing soda could replace dues collection; remove the pop machined from the building completely, or the machines should be put back just the way they were before. 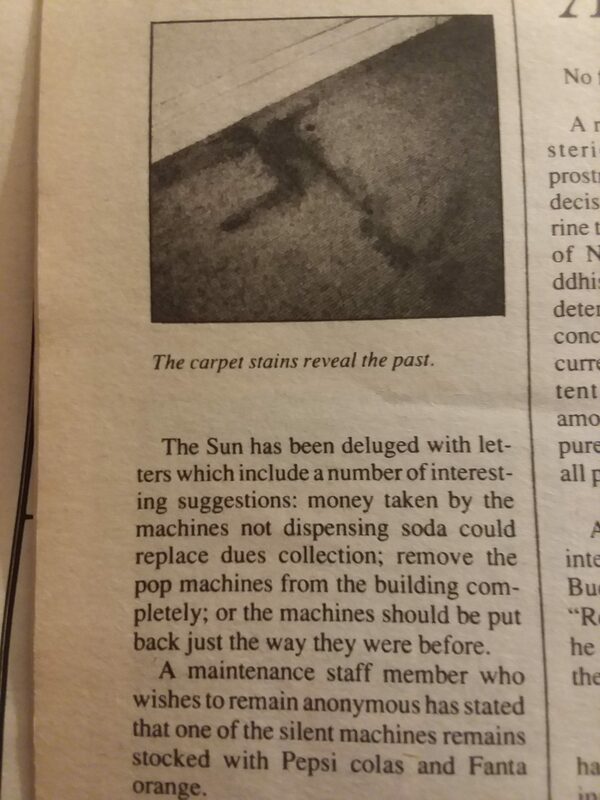 A maintenance staff member who wishes to remain anonymous has stated that one of the silent machines remains stocked with Pepsi colas and Fanta orange. Nevertheless, the sight of the machines standing quiet and dark at the end of the hall has saddened many. They will miss the soft hum and warm glow of the selection buttons as a comforting background to sitting meditation practice. ROLF! Love it. Thanks for posting this treasure from the past. My pleasure! I was ROLFing too … that’s how I knew this was the one to kick off the column with. Blast from the past… I never got anything outta those things, but sure tried. So I guess Old News is Good News eh?